Whether we participate on higher education projects as an owner, designer, or builder, we all share a common goal. The projects we team on are long-awaited fulfillments of strategic aspirations, an expression of the academic and social advancement that is a driving force at great universities. Our higher education clients navigate a variety of challenges and inputs as they plan capital projects. These include changing technology needs, future curriculum changes, and site and infrastructure unknowns. Planning, funding, and building these projects is understandably a long process, with countless big decisions to make and multiple stakeholders to engage. The unintended but frequent challenge that comes with the process is keeping everything to a fixed schedule. Fortunately, the scheduling and execution of campus projects on a fixed deadline is benefitting from the application of new technologies and creative innovations in project delivery. We have encountered this deadline dilemma on nearly every large-scale education project and the lessons learned along the way are worth sharing. Selecting the right people for planning, design, engineering, building, and client-side management is the single most beneficial action a university can take to keep a project on track. Experienced professionals, with the expertise and disposition for continual innovation, will create the path to success on a complex, schedule-challenged project. They anticipate challenges and work in unison to resolve them. Some of the most time-consuming challenges result from unexpected infrastructure and subsurface conditions. On today’s urban campus projects, subsurface parking is becoming standard practice. City environments are notoriously complex, with site utility and soil or geotechnical work often a given. The earlier action is taken to investigate existing issues and remedies, the less risk and impact there are on building schedules. 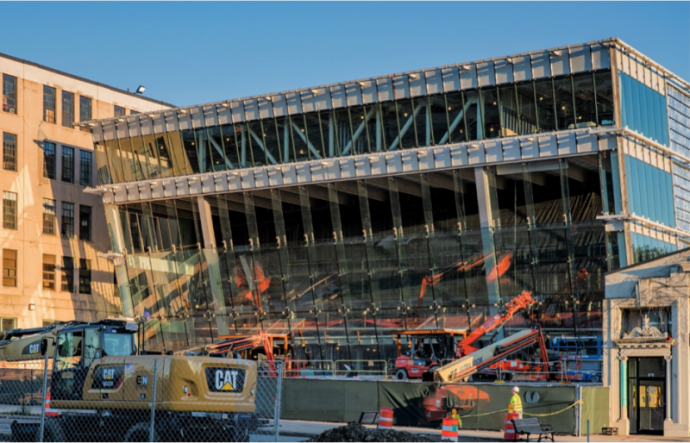 The sheer cost and complexity of a new university building means that no single entity will know all that is needed to produce it at the highest level of efficiency, value, and appeal. On the Boston University (BU) Joan and Edgar Booth Theatre & Production Center project, we collaborated across multiple disciplines early on, working together with the designers and key subcontractors to make informed decisions on the building’s systems, materials, and budget. Many new multi-use and cross-disciplinary campus buildings can benefit from a phased building and occupancy schedule. At BU, we knew the classroom, production, and student service components of the new performing arts education building needed to be ready for September use. Phasing construction to open the theatre space late November allowed resources to be concentrated on that goal. Employing Lean practices allows the team to reduce the schedule for a wide variety of tasks. Instead of allowing each task to expand and fill available time, efficiencies are identified through pull planning. By working from a target completion date back to the present instead of projecting ahead, tasks are identified and timed with the input of the entire team. During the pull planning sessions, a list of constraints is developed that would prevent work from being put in place on schedule. These constraints include design clarifications, submittal approvals, material lead times, and regulatory approvals. Tasks, new developments, labor availability, and material lead times are worked into the schedule, based on the “pull” of the tasks ahead. Adjustments can quickly be made to add resources, optimize on-site productivity, or reduce congestion through just-in-time deliveries. Employing Lean practices elevates schedule performance by identifying opportunities to streamline or combine tasks and reduce inefficiencies. One component of Lean, and an essential element of schedule management, is the standup meeting at the start of each day. 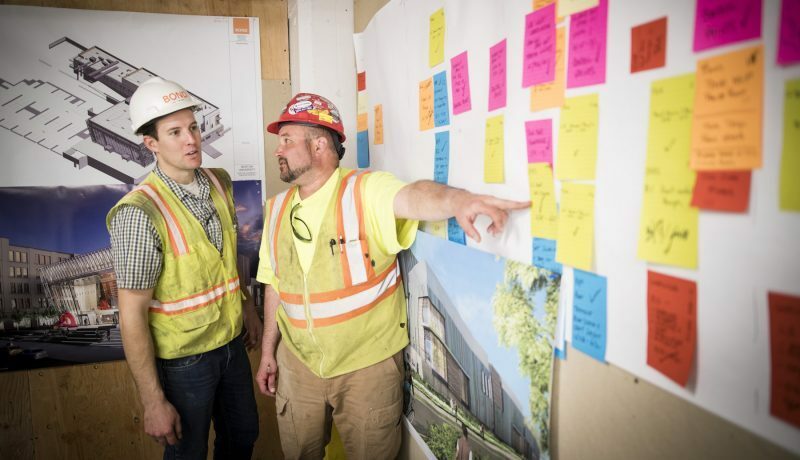 Specific tasks within the work plan are identified on post-it notes and whiteboards, and reviewed by project leaders from across the entire team, including subcontractors. The morning meeting routinely spots and solves problems early, and provides the opportunity for creative innovation and cross-discipline collaboration. Shared technology tools and prefabrication can enable the team to streamline the schedule while significantly elevating quality control. Projects are now built first via design and building modeling programs shared among the entire team. By continually investing in technology tools and training, we find the return on investment translates measurably to shaving cost and schedule for our clients. Increasingly, these shared tools also avoid the need for later-stage changes and surprises, since conflicts and missed data can be caught early on. Off-site fabrication allows for items normally built only after the building shell is complete to be pre-built in a safe, controlled environment while the foundation is being dug at the site. Delivery and installation of items such as mechanical, plumbing and fire protection are executed following a precise schedule. We enjoy the exhilaration – and the challenge – of helping fulfill the transformational aspirations of our higher education clients. By participating early in the process, and advising on the decisions impacting schedule, we help them make it to the long-awaited finish and celebrate an on-time opening. Ken leads BOND’s Education business unit and has over 30 years’ construction management experience. Previously working on the academic client side, he brings tremendous value to his role in understanding clients’ needs and the particular sensitivities surrounding campus construction projects. His experience includes large-scale projects such as residence halls, science centers, athletic facilities and theaters for many of the region’s most prestigious colleges and universities. Charlie has more than 25 years’ experience in the construction industry, with a focus on managing complex academic projects. He has led the preconstruction and construction efforts for several major projects across Greater Boston. His expertise includes customized project delivery, LEAN and sustainable construction. His in-depth understanding of the academic market along with his results-driven management style offer strong value to his clients. Subscribe to our blog for the latest industry insights from BOND.